Tuesday Tip: Don’t Sweat the Small Stuff: Savor it! I tend to find myself feeling a bit, well, schmoopy, this time of year. As the seasons change and class picnics and school concerts fill the calendar, I am reminded daily of how fleeting this time with our children is; of how today’s hardships provide tomorrow’s humor and how, in the blink of an eye, these little ones who needed us move on, move up and move out. 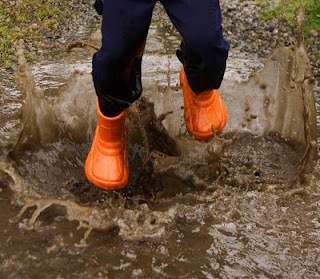 One of life's simple pleasures: Puddle Jumping! Ok, technically, with our oldest only seven, I know that no one is moving out any time soon but, I can’t help but be struck by the fact that our seven and five year old are pretty much over me. Sure, they still need me in some ways but, I’m no longer the center of their world. Whereas they once thought I could do no wrong, they now know that I can and do. They are smart, independent and savvy. And that’s the way it should be. These are the things that make Mommy Days memorable — and the reasons why it’s just not worth it to sweat the small stuff. In the end, the small stuff will be forgotten, your small ones will be big and we’ll realize that little did we know, it was some of these small things that mean the most. Hopefully, like the day that I took the morning off to splash in puddles!